Heat oven to 375°F. Mash 2 of the bananas to measure 1 cup mashed; reserve remaining 1/2 banana. In large bowl, beat sugar, butter, vanilla, eggs and mashed bananas with electric mixer on medium speed, or mix with spoon, until well blended. Stir in flour, baking powder and salt. Stir in chocolate chips and 1/2 cup walnuts. Drop dough by 1/4 cupfuls about 2 inches apart onto ungreased large cookie sheet. Bake 11 to 15 minutes or until set and edges begin to turn light golden brown. Cool 1 minute; remove from cookie sheet to wire rack. Cool completely, about 30 minutes. Mash enough of remaining 1/2 banana to measure 2 tablespoons mashed. In medium bowl, stir frosting and mashed banana until smooth and spreadable. Spread each cookie with about 1 tablespoon frosting. Sprinkle 1/4 cup walnuts over frosted cookies. 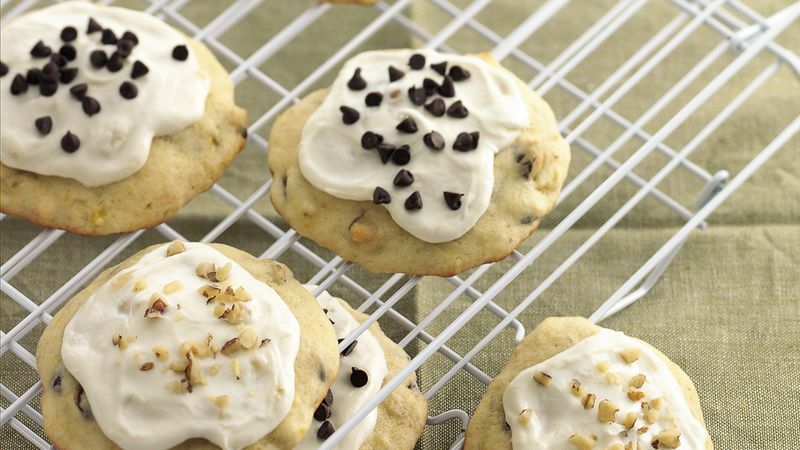 Using a spring-handled ice-cream scoop to drop the dough ensures cookies of the same size that bake evenly. Allow frosting to harden or become set before storing cookies between layers of waxed paper, plastic wrap or foil.